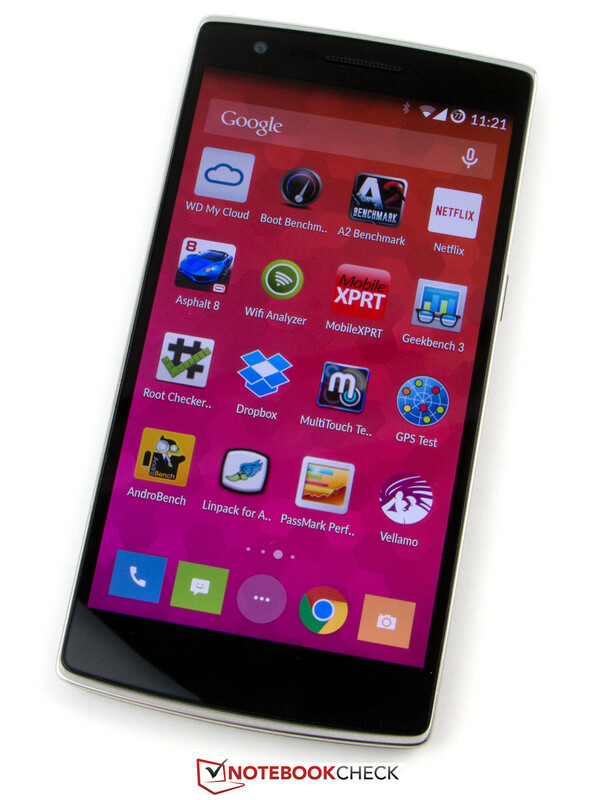 The OnePlus One has finally arrived, and we want to put the self-declared Flagship Killer through its paces. The technical specs are impressive: A Snapdragon 801, 3 GB of working memory, LTE, a maximum storage of 64 GB, a generously sized battery, and a large Full HD screen adorn the review sample. All this is available for just 299 Euros (~$322). 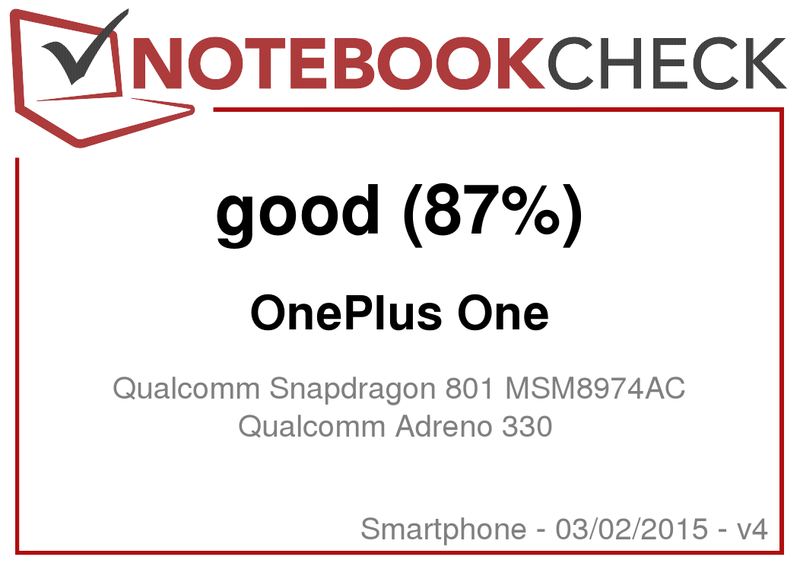 In view of the price, mid-range smartphones like the Lumia 830 or the Desire 820 should be used for comparison, but their configuration is clearly inferior to that of the OnePlus One. Premium smartphones from the competition would be more suitable owing to the similar specification lists. Among them: Samsung's Galaxy S5, HTC's One M8, Sony's Xperia Z3, LG's G3, Nokia's Lumia 930 and Apple's iPhone 6 Plus. 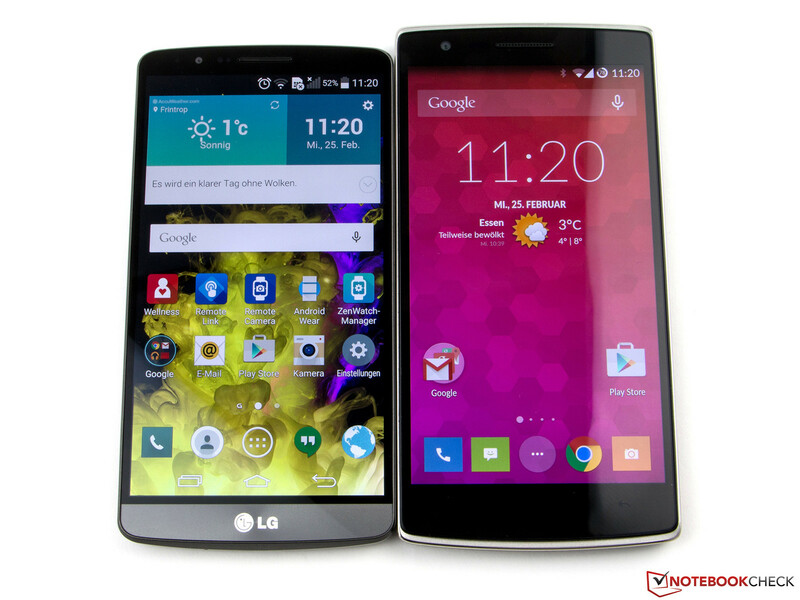 LG's G3 (left) is slimmer despite the same screen size. The SIM slot is not easy to find right away. 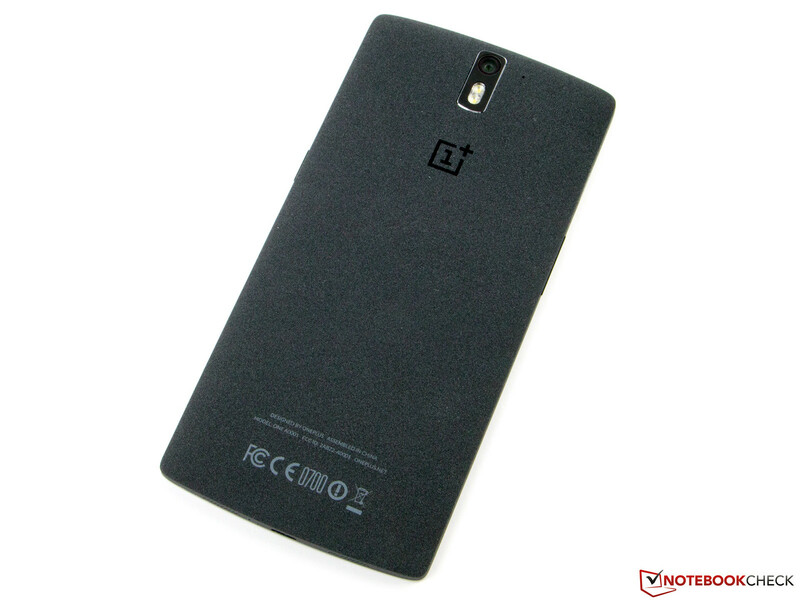 The OnePlus One is available in Silk White and Sandstone Black. In fact, the latter has a roughened surface that feels like sandstone, providing a very good grip. The smartphone's rounded back cover makes it pleasant to hold. Its weight of 164 grams (~5.8 oz) is in the midfield. The smaller Moto X (145 g; ~5.1 oz) and the Galaxy S5 (145 g; ~5.1 oz) are lighter. Both the iPhone 6 Plus (172 g; ~6.1 oz) and the LG G3 (149 g; ~5.3 oz) have the same screen size. The former is slightly heavier, and LG's device is lighter and slimmer. The review sample proved to be tremendously stiff, and could barely be warped. It did not produce any noise during the attempts. It also resisted pressure at the display's edges. We could only see a light wave formation in the screen's lower edge. This became more visible when firm pressure was applied to the back. 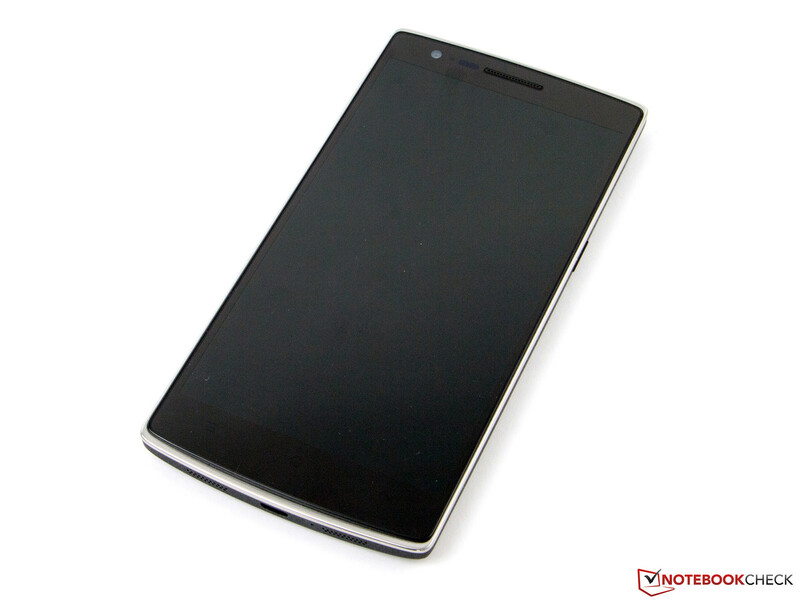 The gaps of OnePlus One are even and do not give any reason for complaint. The battery in the device is non-removable, and is not intended for the user to replace. However, there are plenty of instructions for this on the Internet because it is relatively simple to access the battery. The SIM slot closes flush with the rest of the casing and is not easy to find right away. The slot accepts micro SIM cards, but an adapter for nano SIMs is also included in the smartphone's accessories. The micro USB 2.0 port of the OnePlus One is used for both charging the device and for sharing data with a computer. It also supports OTG, which makes it possible to connect external input devices or storage devices to the smartphone. 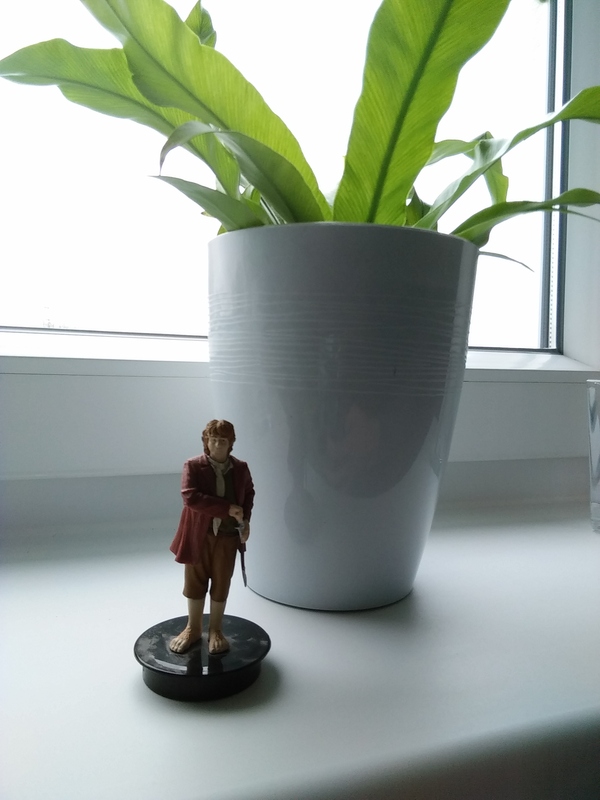 Users who would like to display pictures on an external device will need a Miracast receiver because the device does not support either MHL or DLNA. 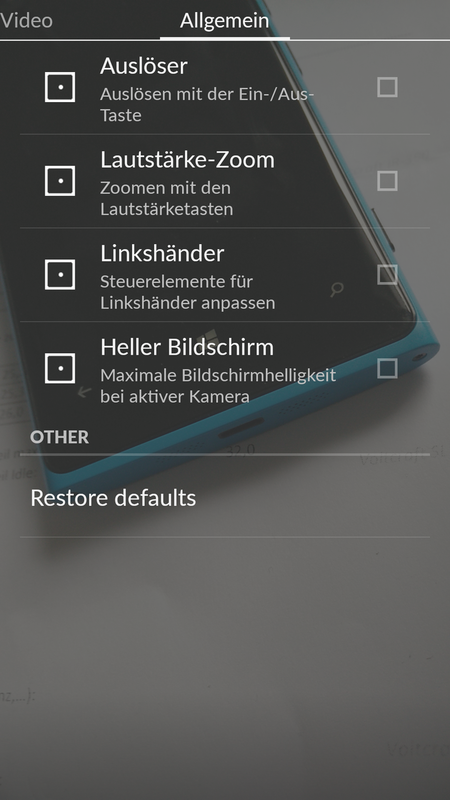 A micro SD slot for expanding the storage is not available. Thus, buyers who opt for the 16 GB model will be confronted with storage issues in the long run. 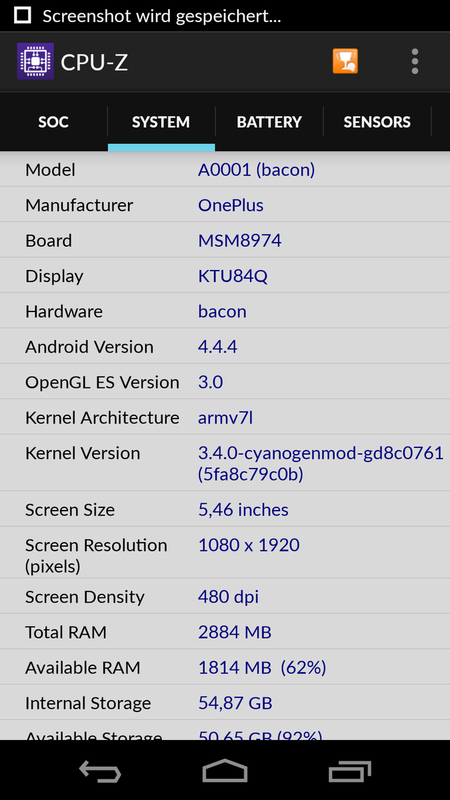 OnePlus uses the CyanogenMod 11S operating system that is based on Android 4.4.4 KitKat of the Android Open Source Project (AOSP). 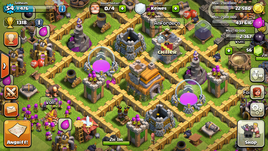 An update to version 12 has been announced for March. Since the developers of CyanogenMod and OnePlus have had disagreements, it will also be the last update. This year the manufacturer is planning to switch to a proprietary operating system, Oxygen OS, which is expected to be based on Android 5. CyanogenMod 11S varies from version 11 that is available for download. 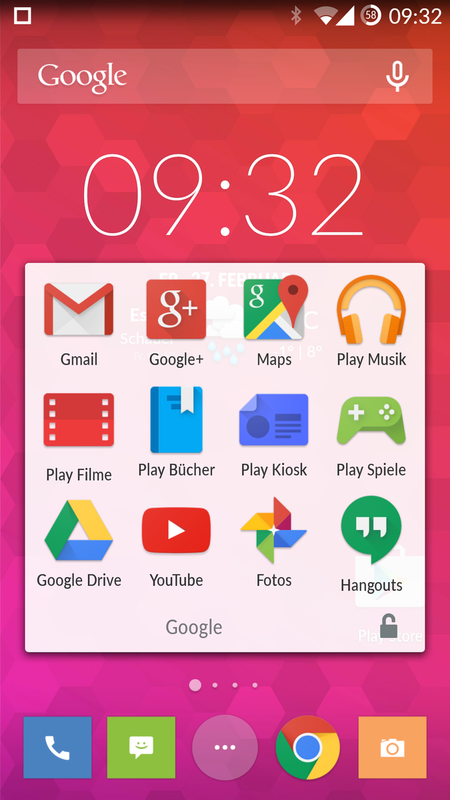 The most obvious difference is the preloaded Google apps, making it possible to directly access the Play Store and other services. 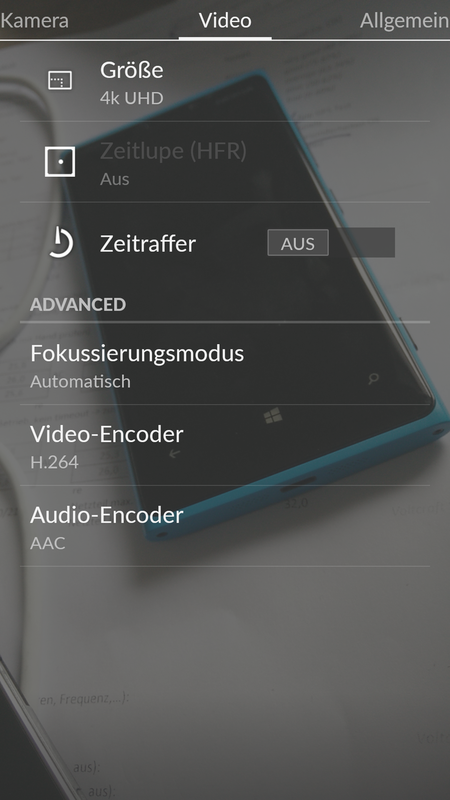 In addition, the camera app and music equalizer have been modified. 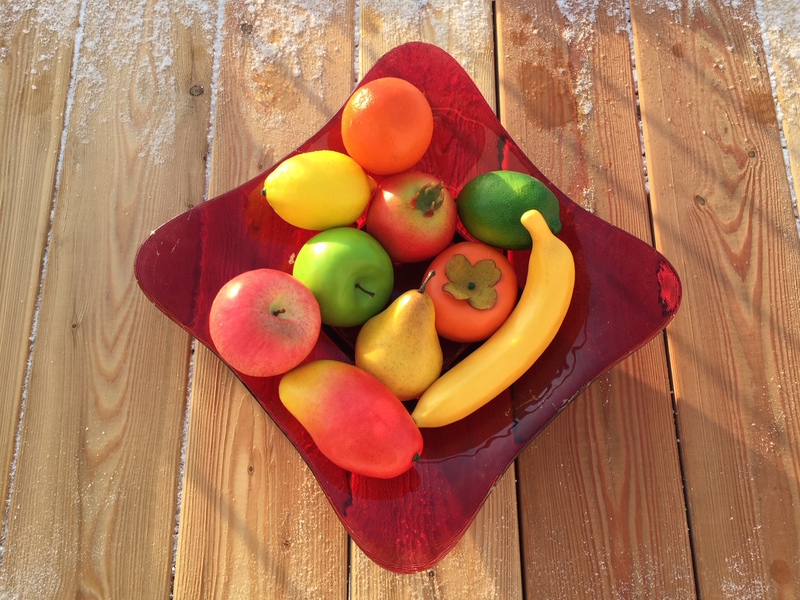 There are various designs to choose from, and more can be purchased seperately. Furthermore, it has gesture control and can be awakened from standby by double tapping. 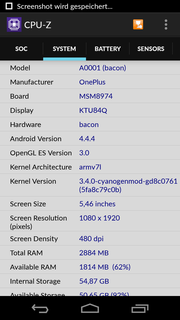 The OnePlus One relies on modern communication standards and supports IEEE 802.11 a/b/g/n/ac. 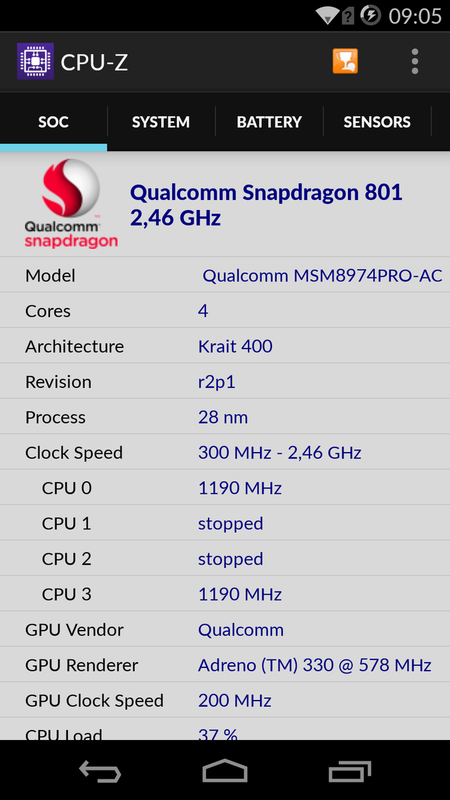 Consequently, it transmits in both the 2.4 and 5.0 GHz frequencies. The range is also decent. 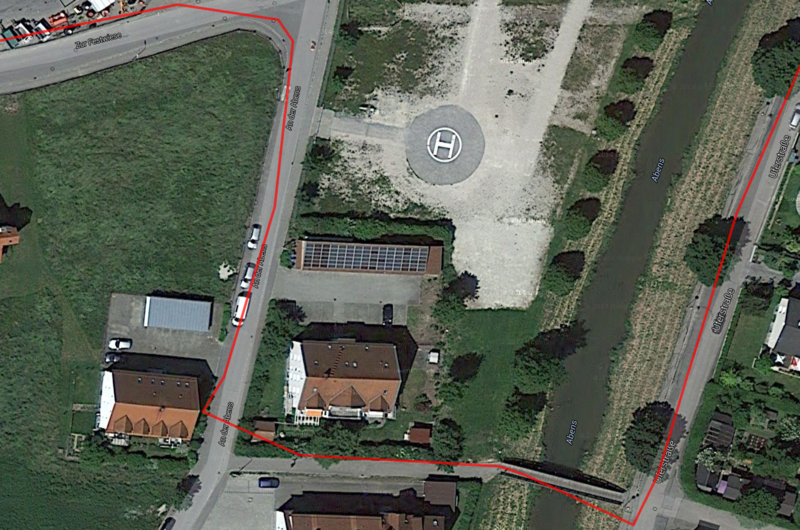 We still had a good signal quality even 15 meters (~50 ft) away from the AccessPoint (Devolo dLAN 1200+ Wi-Fi) and through two walls. Internet browsing was possible without noticeable lags. The smartphone can connect to mobile Internet via HSPA+ (max. 42 Mbps) or LTE Cat. 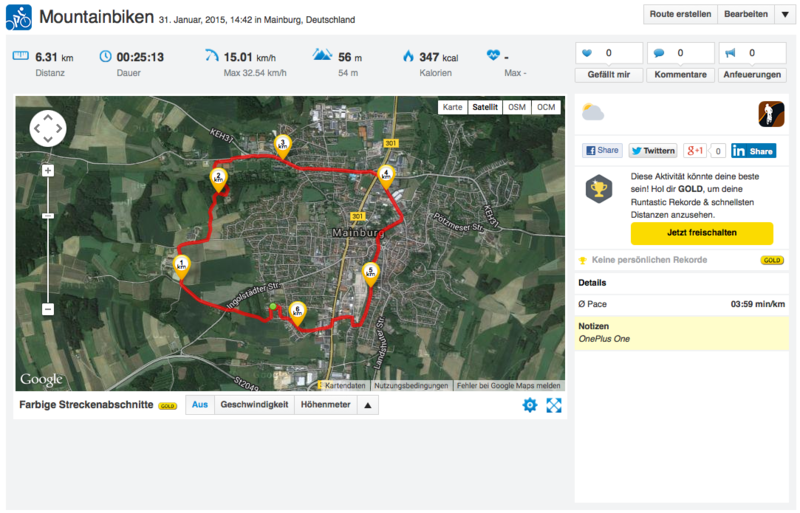 4 (max. 150 Mbps). Both alternatives offer very wide frequency coverage. Our global model also supports a TDD-LTE frequency so that it should be possible to enjoy high-speed Internet almost everywhere in the world provided that the corresponding network is available. However, we missed the 800 MHz band that is frequently used in Central Europe. 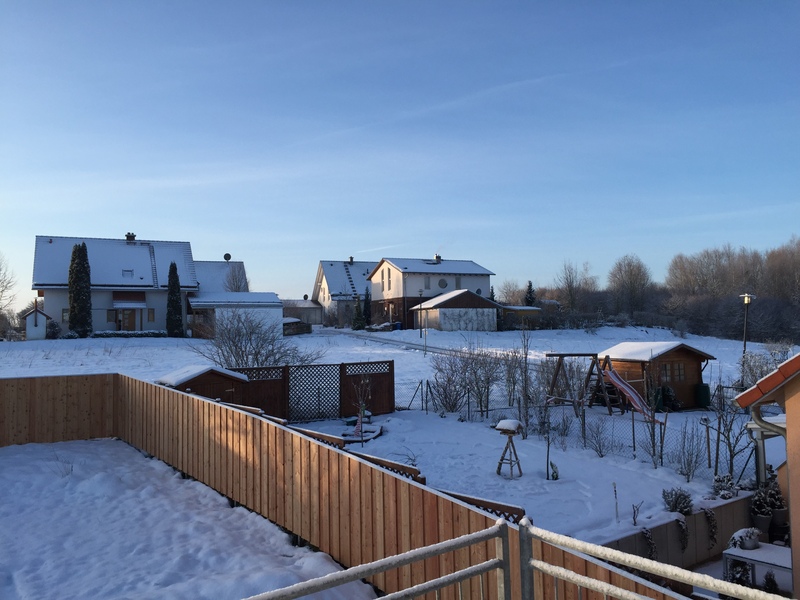 GPS and GLONASS are available for localization, and is relatively fast indoors. 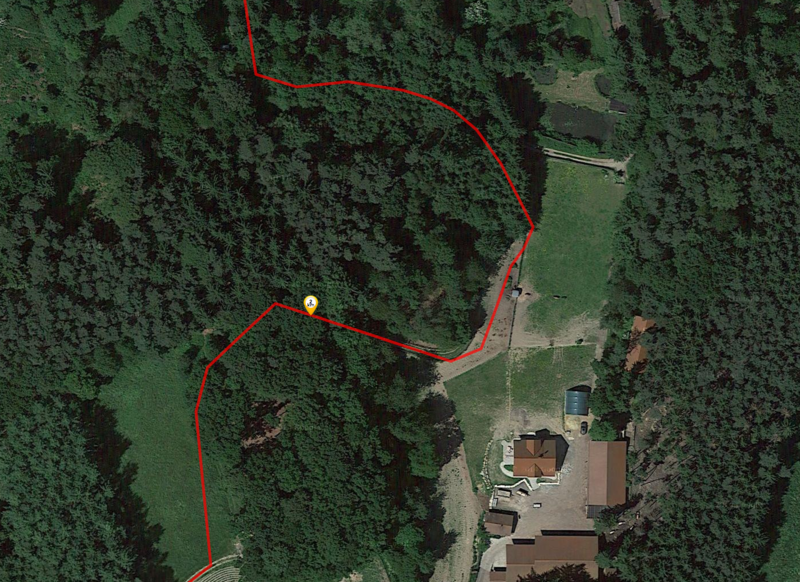 It is even slightly faster outdoors; reception is good. 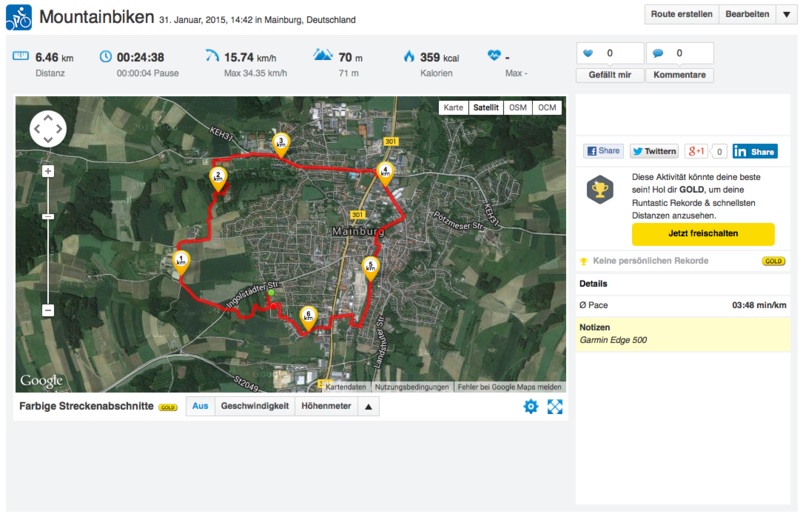 The OnePlus One does not have to shy away from a comparison with the Garmin Edge 500 bike computer. 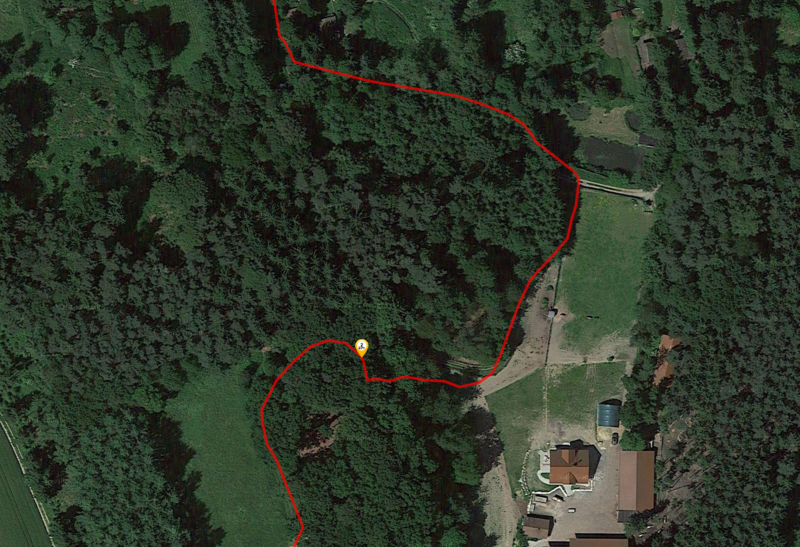 Although it had more problems than the navigation system on tight paths, the smartphone was impressive in the woods. 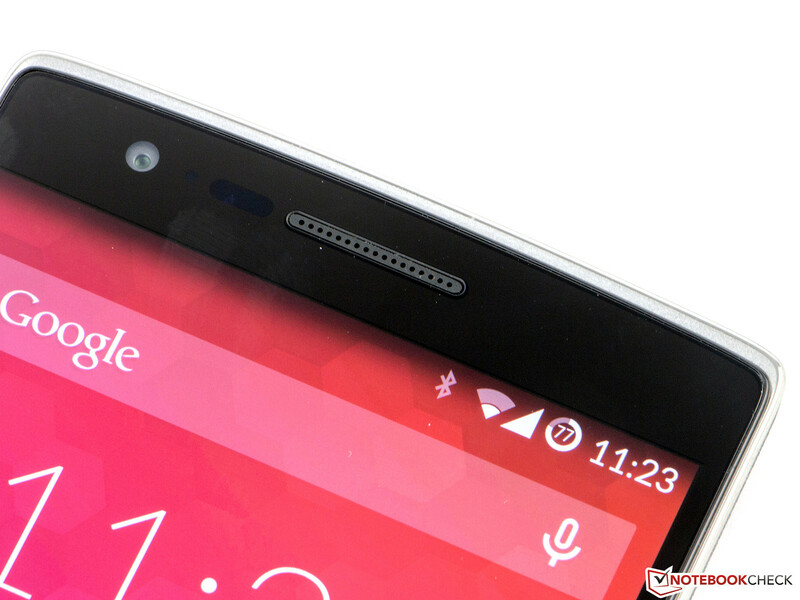 The OnePlus One has a total of three microphones to achieve a good voice quality. Both call parties were well understood. Background noise is decently suppressed, although it remains audible when it is very loud. The speaker is also suitable for making calls; we heard the caller very clearly. However, when the smartphone was placed on a table half a meter (~1.5 ft) away, the voice of the OnePlus One user echoed very audibly but could still be understood very well. 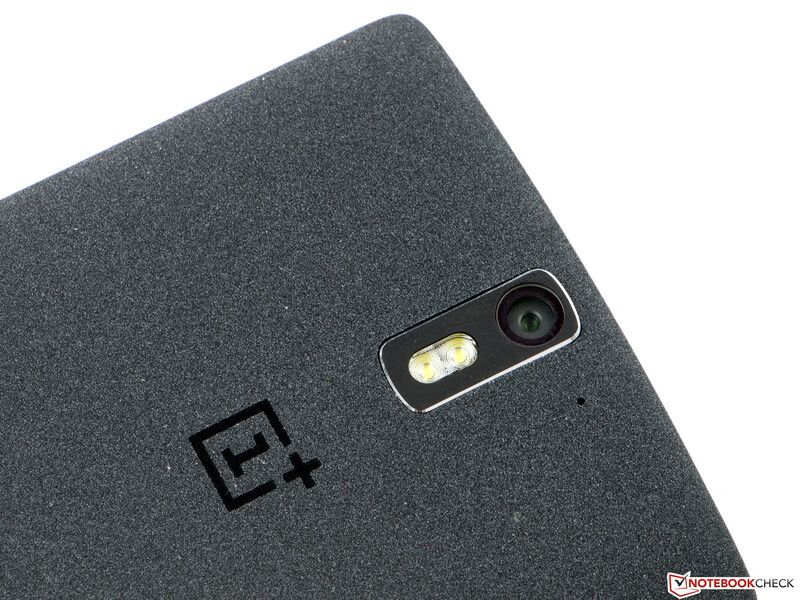 The OnePlus One has a 5 MP front-facing camera (max. 2592x1944 pixels), which takes decent pictures as long as the light conditions are good. The image quality decreases greatly when it gets darker. However, the lens is suitable for selfies and video-chats. The primary camera from Sony achieves up to 13.1 MP, is supported by a dual-LED flash and has extensive setting options. 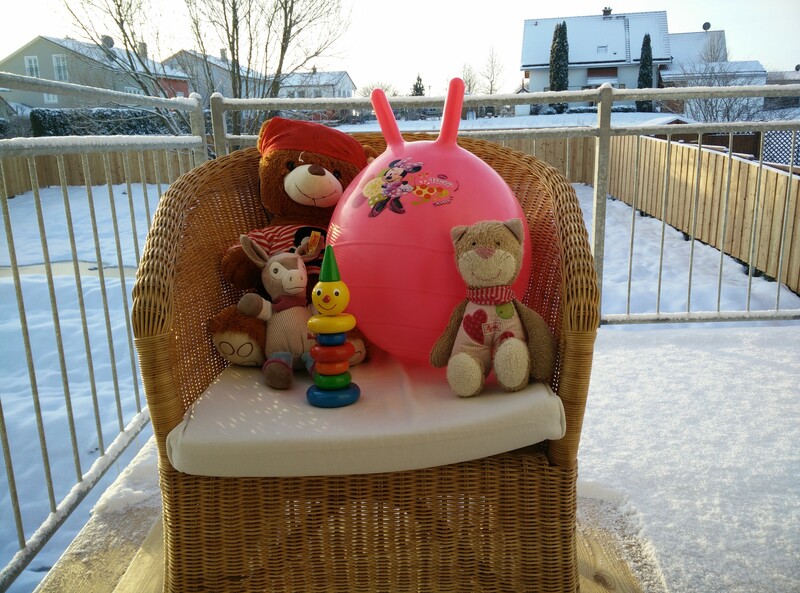 The daylight image quality is excellent. 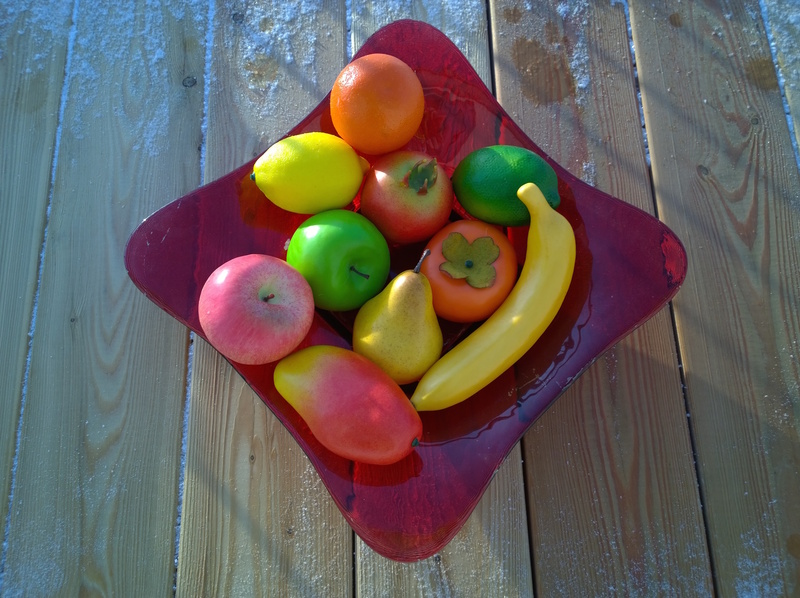 Colors look natural, and the focus is decent, although it decreases slightly at the edges. The smartphone also tends to overexpose slightly. The primary camera's quality also decreases in low-light situations. 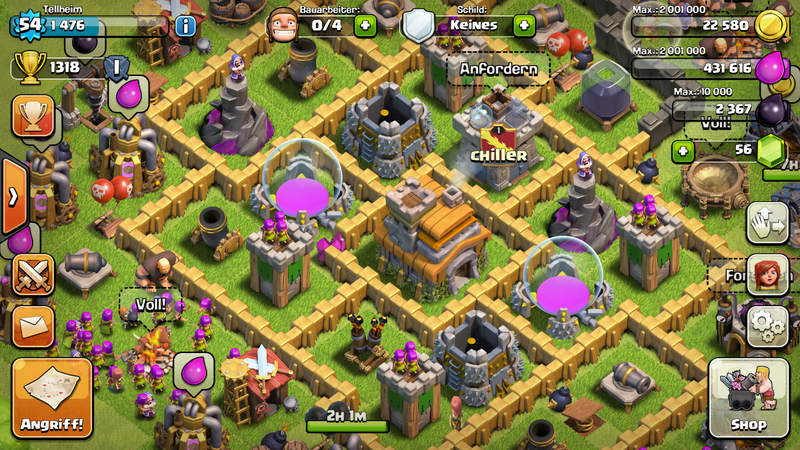 Although the noise is suppressed quite well, dark details are displayed as black spots. Videos can be recorded in Ultra HD. The image quality also makes a good impression. 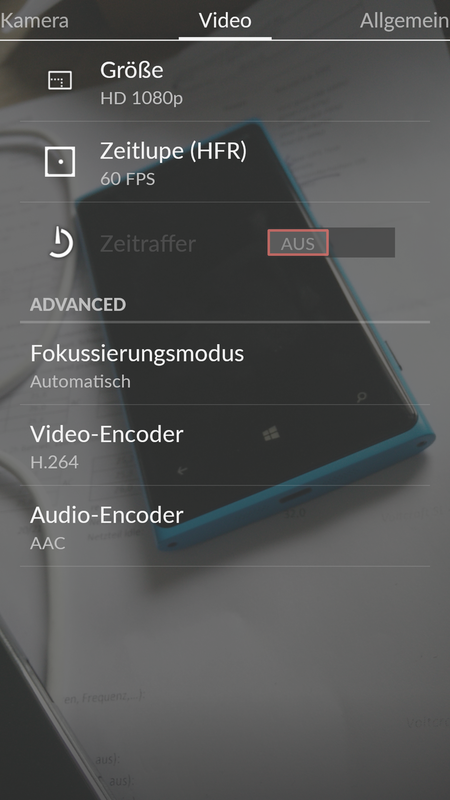 Users who prefer to record in Full HD, can do so with 60 fps, which is suitable for both HFR and smooth slow-motion shots. 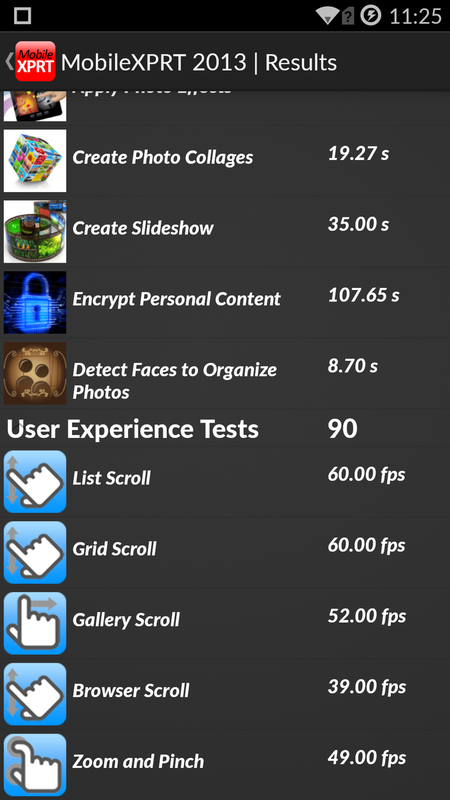 A time-lapse feature is also available. 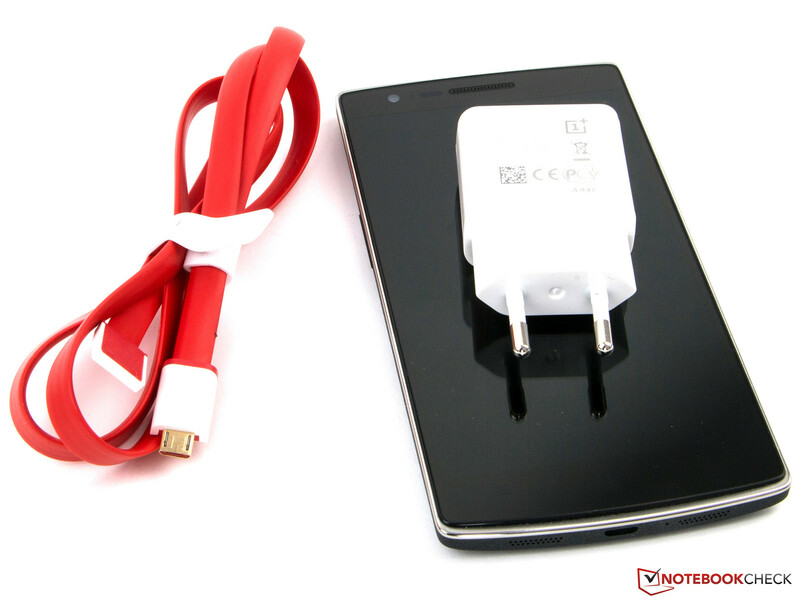 The OnePlus One comes with a modular power supply and the corresponding data cable. Screen protectors, covers, data cables, and headsets can be ordered separately from the Online Shop. The product is shipped directly from China, but OnePlus includes a one-year warranty on its smartphone anyway. 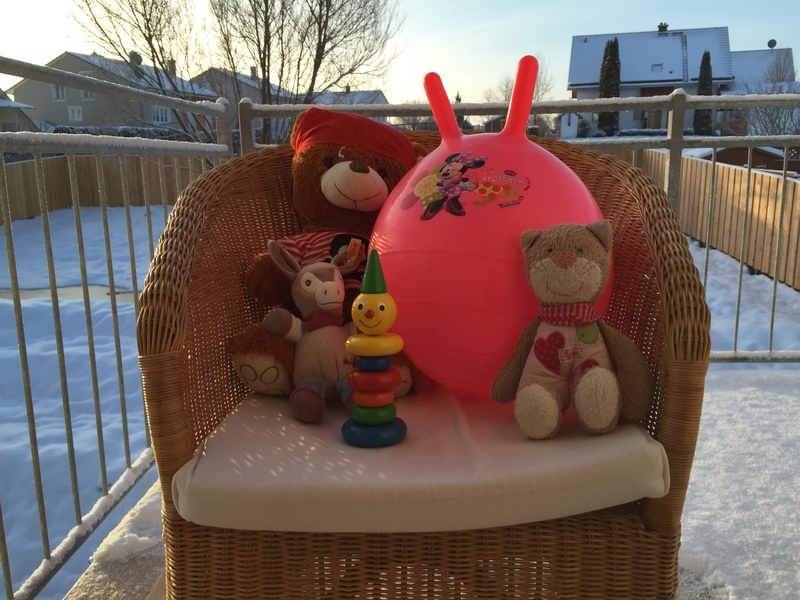 EU-based customers receive two years. The company promises an uncomplicated processing in cases of damage. 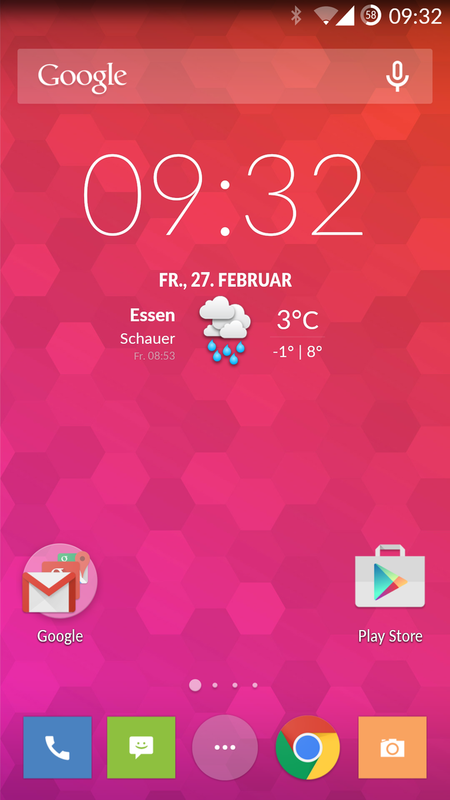 Unlike the default version, CyanogenMod 11S is not rooted. 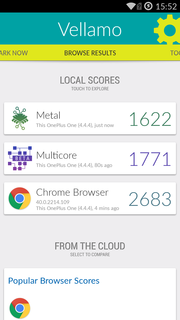 However, users can unlock their OnePlus One if they want to - but at their own risk. The manufacturer is not liable for damages to the smartphone in such cases. A successfully rooted One is not excluded from the warranty. 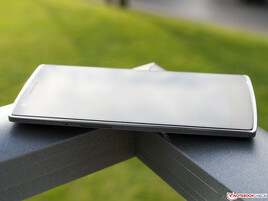 The OnePlus One has a capacitive touchscreen that can detect up to ten fingers simultaneously. The input surface is sleek, and responds very quickly and accurately to gestures. Although the gesture controls are not exceptionally vast, it is a useful input extension that can be used in standby mode. For example, it is possible to play music without reactivating the phone. In addition, the rear-sided, dual-LED can be used as a flashlight or the camera app can be opened directly (see video). 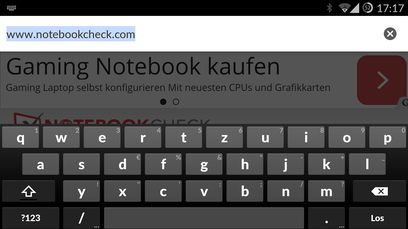 The standard Android layout is used for the virtual keyboard. It is possible to download and install other variants from the Play Store if preferred. Google's well-known voice control is also available in the One. 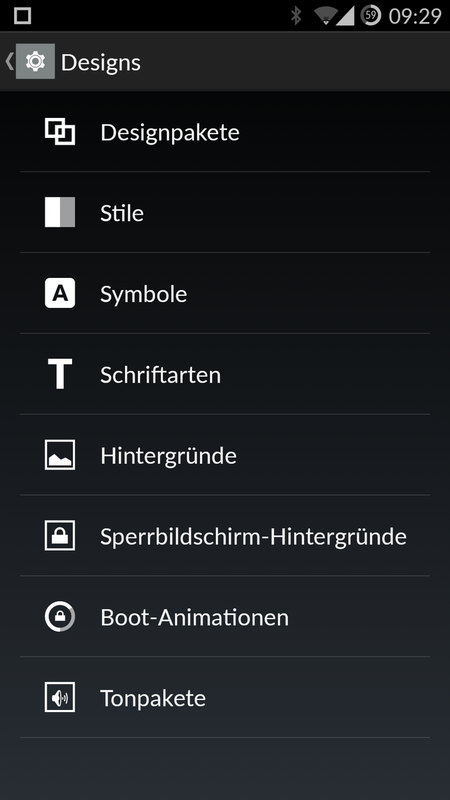 OnePlus leaves the choice of Android controls up to the user. They can use either the capacitive buttons under the screen or the input elements directly on the screen. 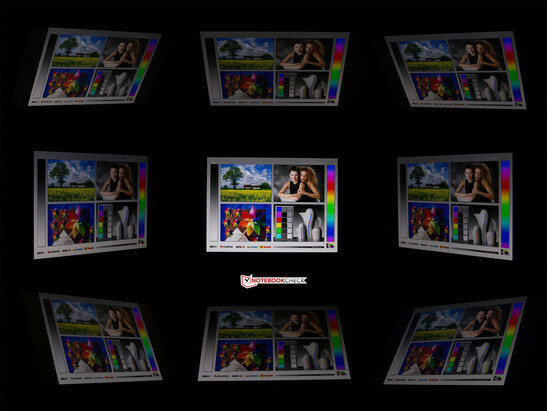 The background light and the duration can be customized for the former. 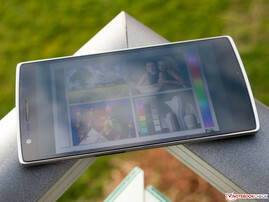 The OnePlus One features a 5.5-inch screen with a resolution of 1920x1080 pixels. 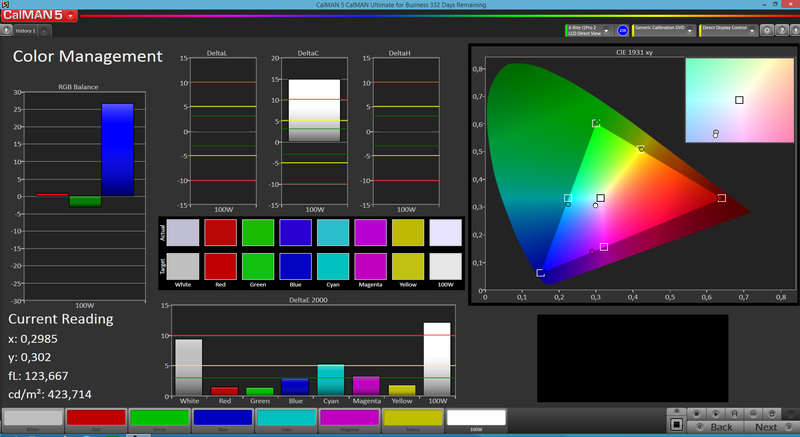 This equates to an aspect ratio of 16:9 and pixel density of approximately 401 ppi. It is razor-sharp, and single pixels are not visible to the naked eye. 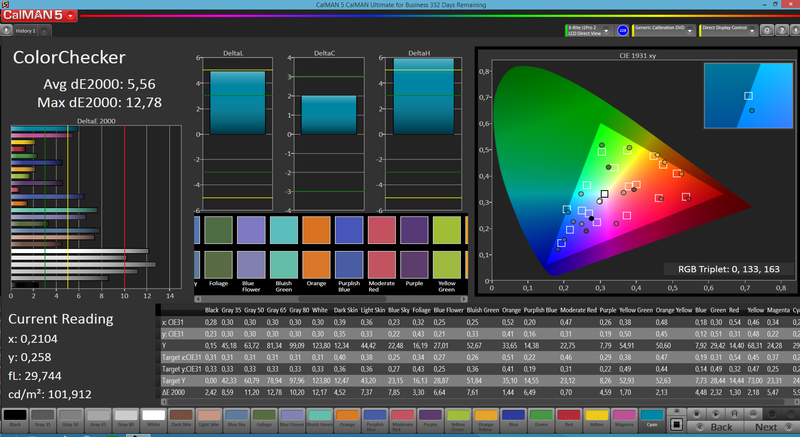 Only LG's G3 achieves a higher pixel density in the comparison field (534 ppi). 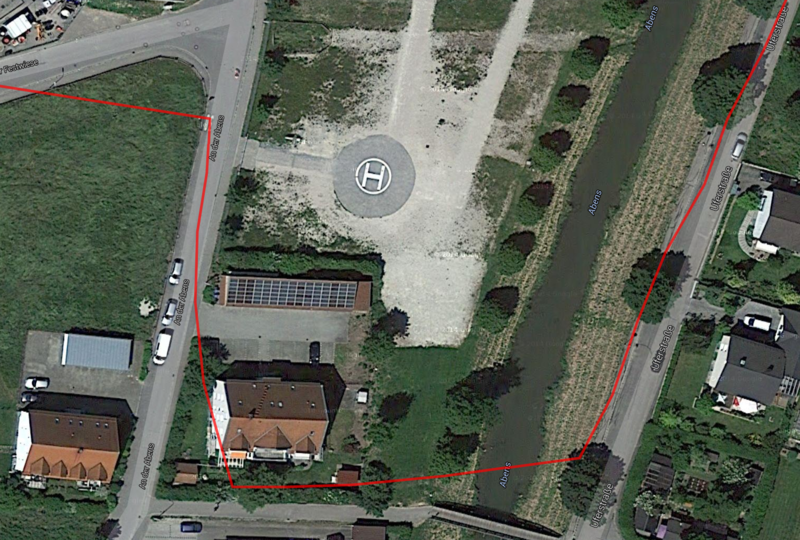 The One is also impressive with its brightness of 437 cd/m². Although some models have a higher brightness, this is still a good rate. The brightness distribution could have been more homogeneous and is on a rather average level. We did not discover the frequently mentioned yellow spots at the screen's edge. 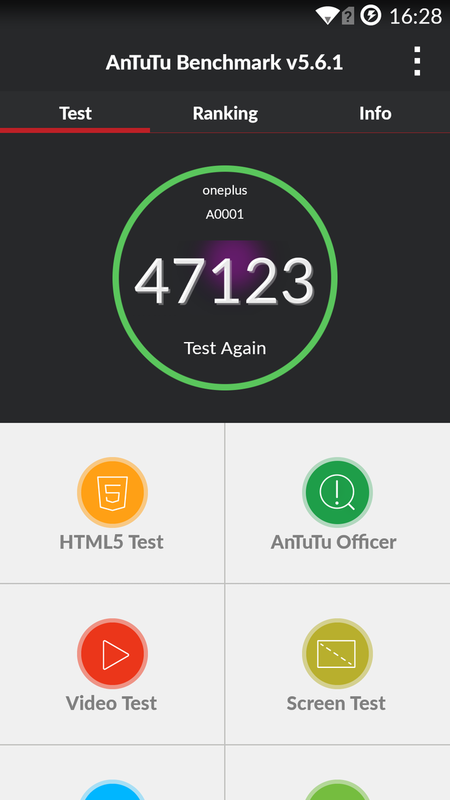 With 0.54 cd/m², the black level of OnePlus' one is at a decent level. 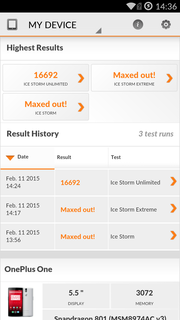 Competitors like the Xperia Z3 (0.72 cd/m²; 975:1) or the LG G3 (0.96 cd/m²; 434:1) are not as good. The review sample's resulting contrast is good, but not outstanding. Rivals with OLED screen have a clear advantage because their black is really deep black. 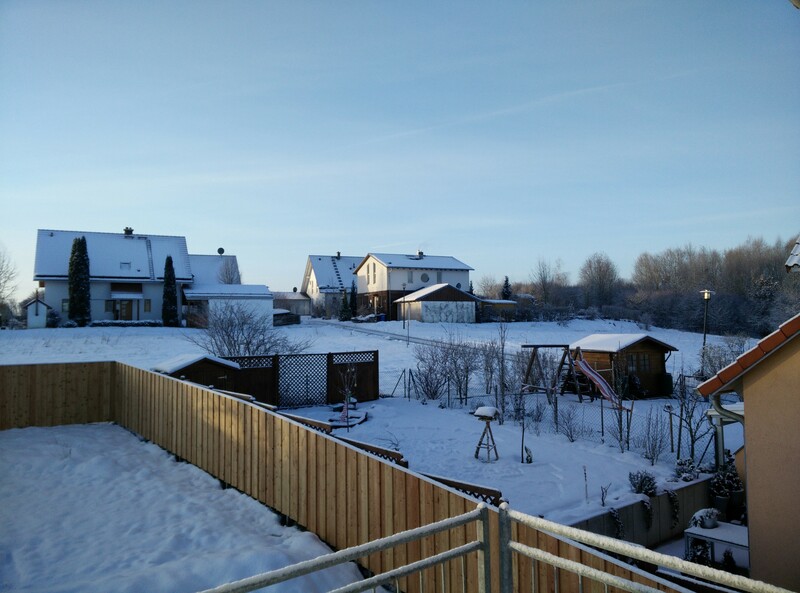 The screen's color reproduction is quite good, but the OnePlus One has slipped up in the grayscale. This is reflected in some significant DeltaE deviations of 12 and a shift in the sRGB balance to blue, resulting in a visible bluish cast that makes the image look a bit cool on white surfaces. 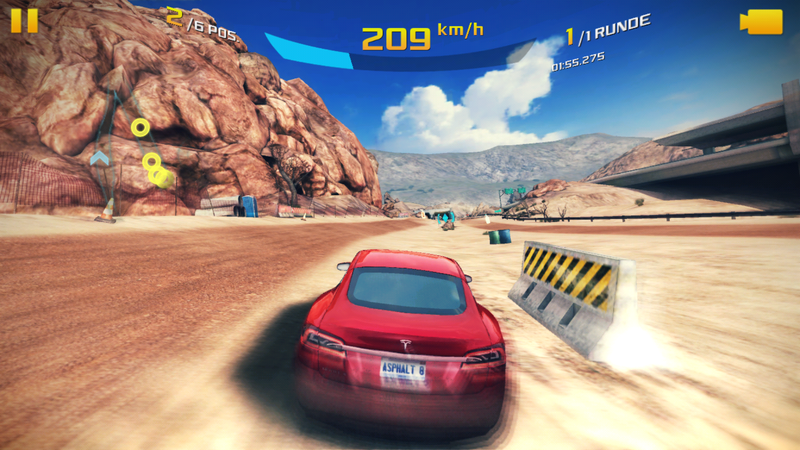 However, this effect can be countered via the extensive settings that the smartphone has for the screen. The OnePlus One looks good outdoors and can impress even in bright ambient light. This is not so much due to an exceptionally high brightness or outstanding contrast, but rather due to the underlying screen technology. There is no gap between the LTPS screen and the protective glass, and thus there is no potentially glossy surface. but the Gorilla Glass is nevertheless reflective. 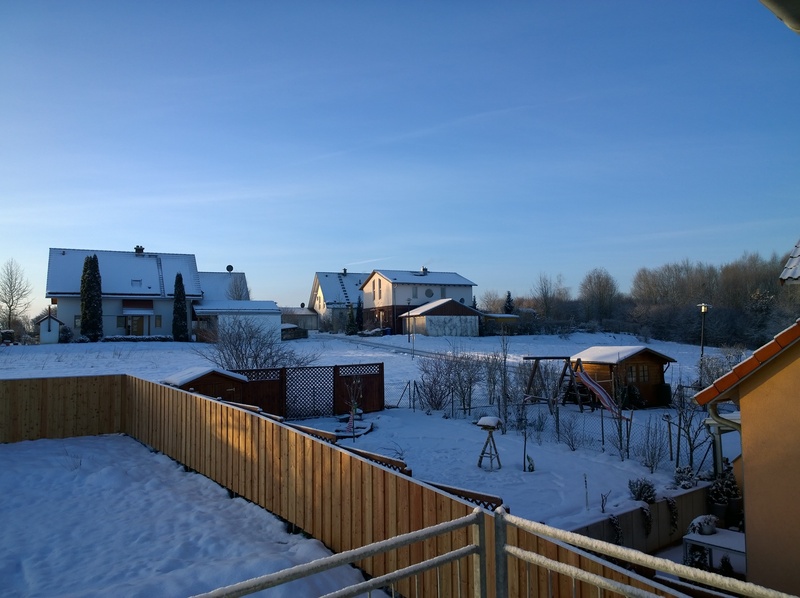 The viewing angle stability of the OnePlus One is compelling. The displayed content remains well legible even from extremely flat viewing angles. Ghost effects were not visible and should not be possible due to the LTPS screen. Only a minor loss in brightness is noticed from an angle of approximately 45 degrees. 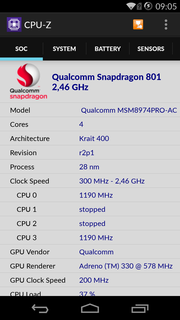 At the time of its release, the OnePlus One was well equipped with its Qualcomm Snapdragon 801 MSM8974AC, which was one of the fastest SoCs available. 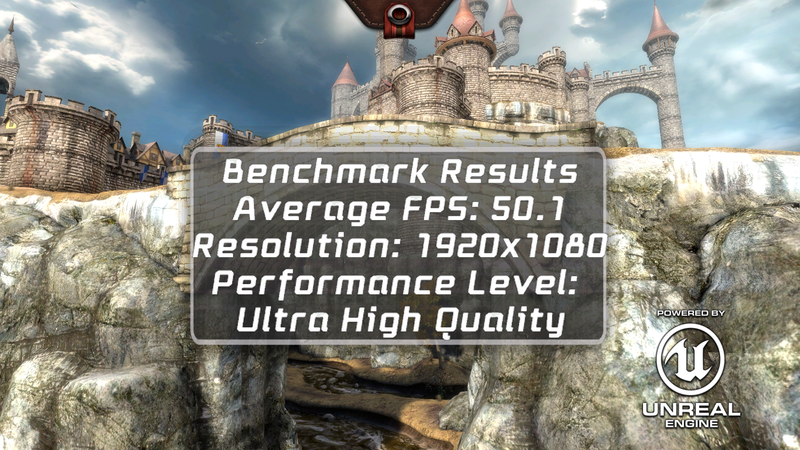 Meanwhile, the Tegra K1, Apple's A8 and Snapdragon 805 outpace the former performance leader. Nevertheless, the SoC still provides a lot of power with its strong quad-core processor, and is supported by a generous 3 GB of working memory. 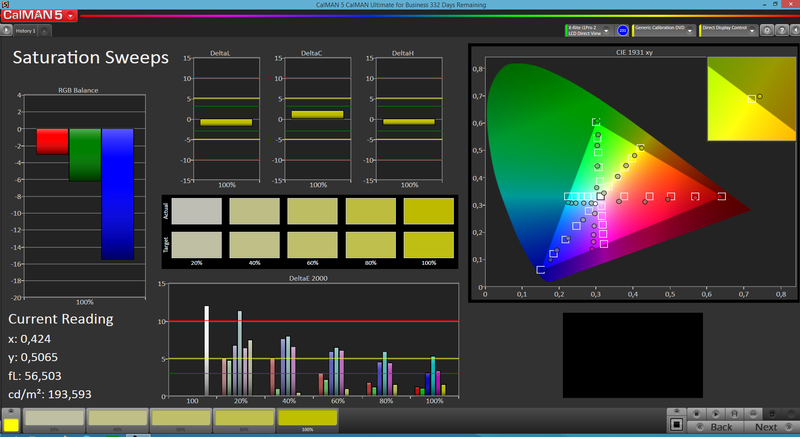 The Adreno 330 is responsible for graphic calculations. 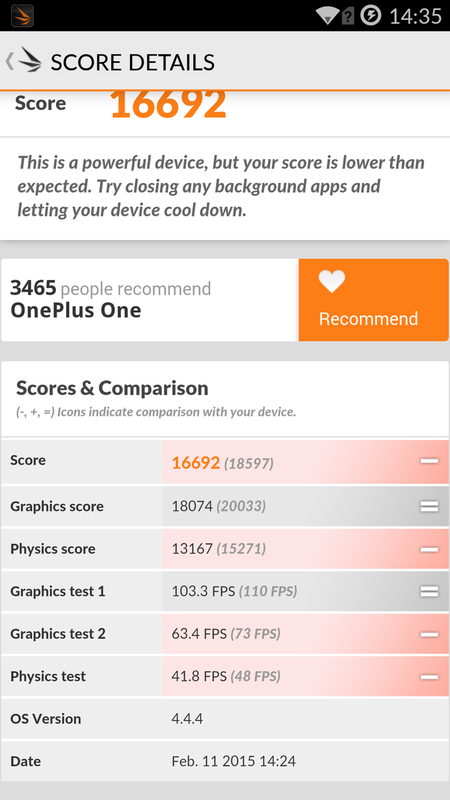 The OnePlus One achieves good results in the graphic benchmarks. 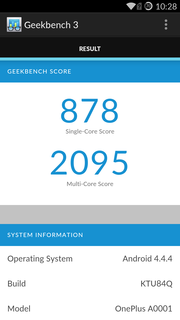 However, not only the nominally stronger iPhone 6 Plus (Apple A8, PowerVR GX6450) or Nexus 6 (Snapdragon 805, Adreno 420) defeat it, but also competitors based on the same SoC. 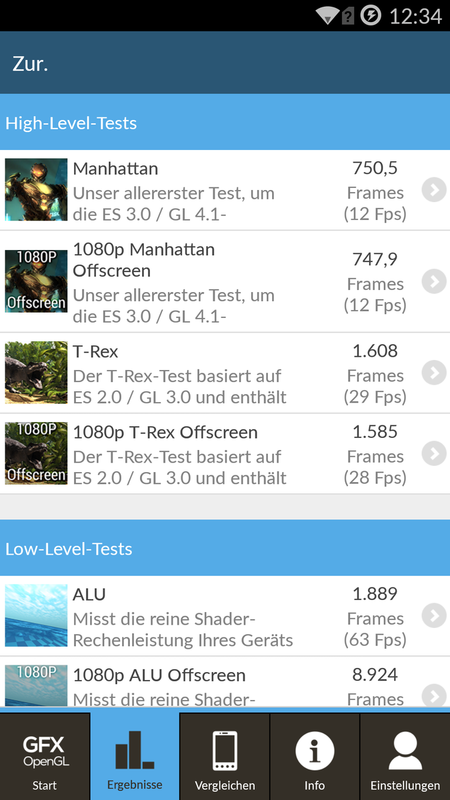 Moto does the best job of getting performance out of the components in the 3DMark comparison field, and achieves a 10% better results. 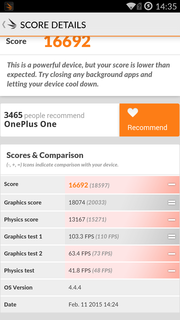 The GPU's scores are on par, but it seems that the CPU in the OnePlus One has problems with the waste heat produced during permanent load, and has to reduce its performance accordingly. 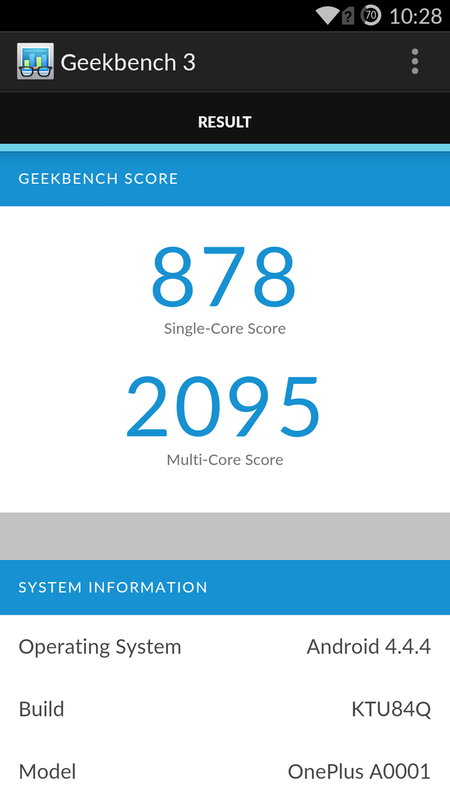 This is particularly obvious in Geekbench 3 where the review sample comes in last. 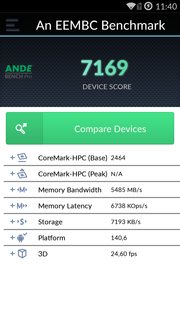 Even the HTC's One M8 (MSM8974AB) that we tested with a slightly weaker Snapdragon 801 is up to 33% faster. 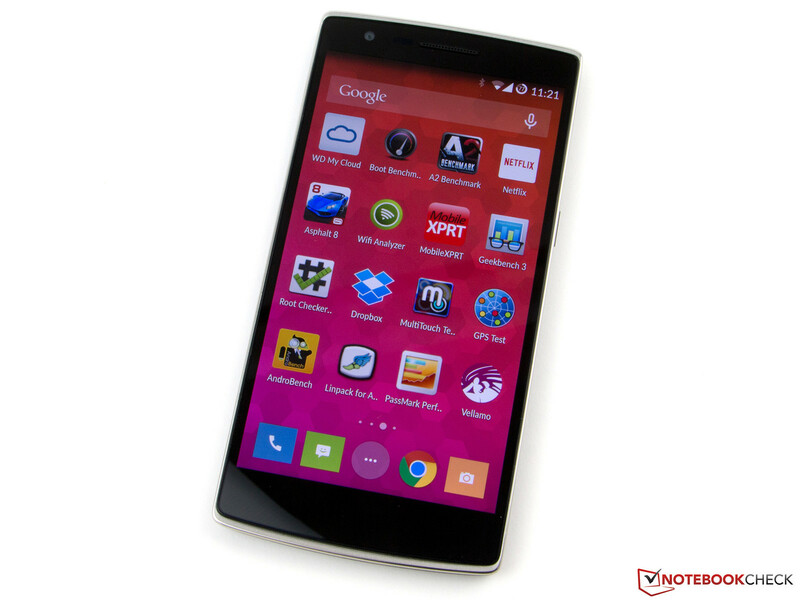 Seen purely subjectively, the OnePlus One browses through the Internet quickly with the preloaded Chrome browser. Only when scrolling websites the smartphone occasionally lags. 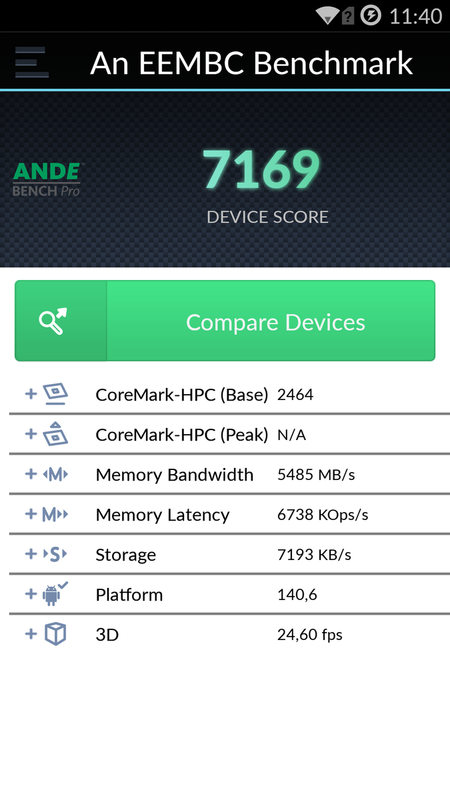 In the benchmarks, it is also usually found in the lower third of the premium-range devices, and even takes the last place in the SunSpider 1.0.2 in the comparison field. 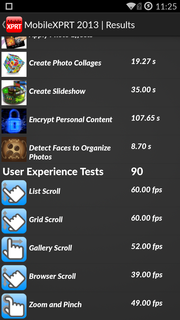 MobileXPRT 2013 shows the weaknesses in detail. 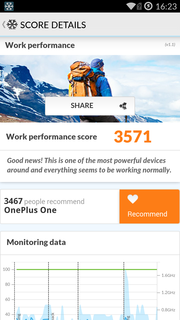 When scrolling in the browser, the OnePlus One actually achieves its poorest rate of 39 fps. 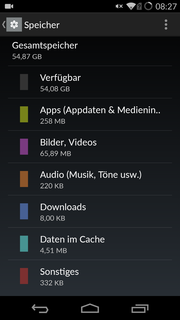 The OnePlus One has a storage capacity of 64 GB of which over 54 GB are available after initial use. Unfortunately, the storage cannot be expanded. Therefore, we would not recommend the smaller 16 GB model. 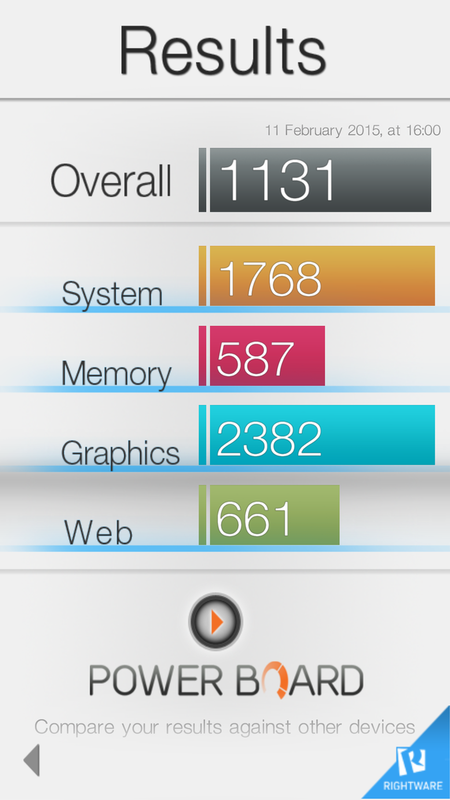 The review sample does not only boasts of having an eMMC 5 memory interface, but also the fact that it also utilizes it. 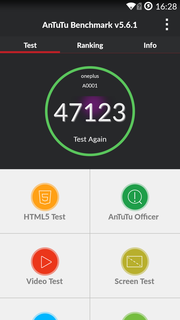 In fact, the flash memory in the OnePlus One is fast and achieves extremely good rates. It even places itself at the top of our database in the sequential read sector. 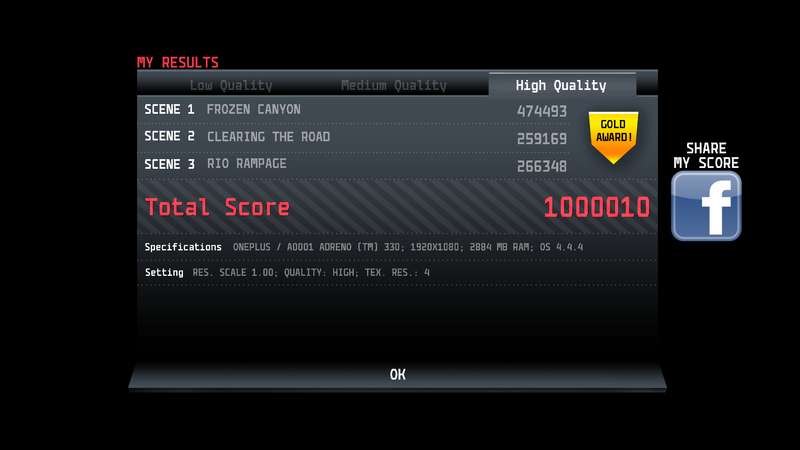 The touchscreen's responsiveness is good. We would have liked the position sensor to be a little more sensitive. 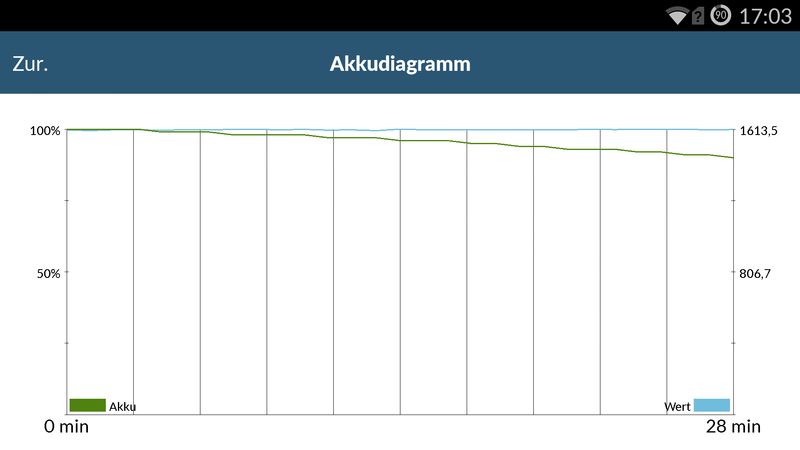 The surface temperatures of the OnePlus One reached a maximum of 32.2 °C (~90 °F) while idling. The temperature increases significantly during the permanent load that we simulated with the Stability Test app. The rates climbed up to 45.5 °C (~114 °F), which is warm but not critical. 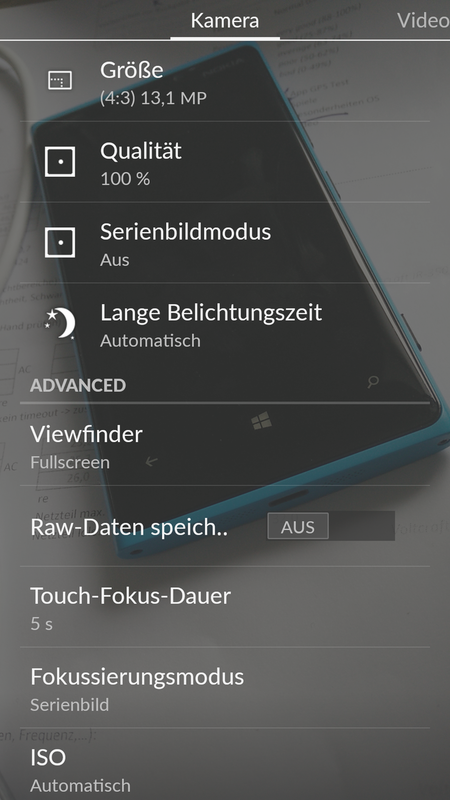 Only the Lumia 930 (max. 48.4 °C; ~119 °F) gets even warmer. The coolest premium-range phone is the Galaxy S5 (max. 37.7 °C; ~100 °F). 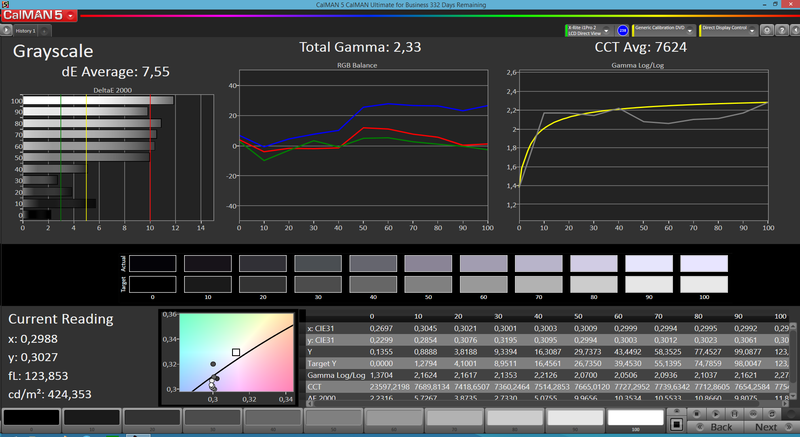 The stress test using the battery test of GFXBench 3.0 went well for the graphics unit. 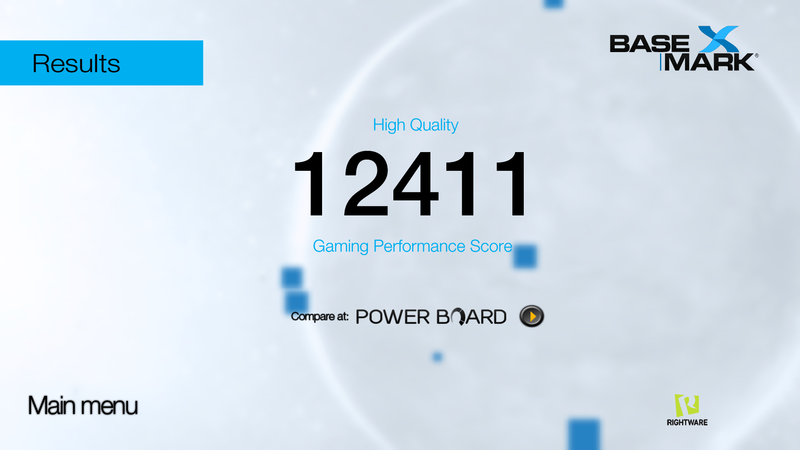 Unlike the processor, the GPU's performance remained stable. Both speakers flank the micro USB port on the lower edge, and thus have a similar placing as those in the iPhone 6 Plus. The sound quality is quite impressive and is particularly good with trebles, which sound quite balanced up to a volume of 50%. Beyond that, they overdrive slightly. 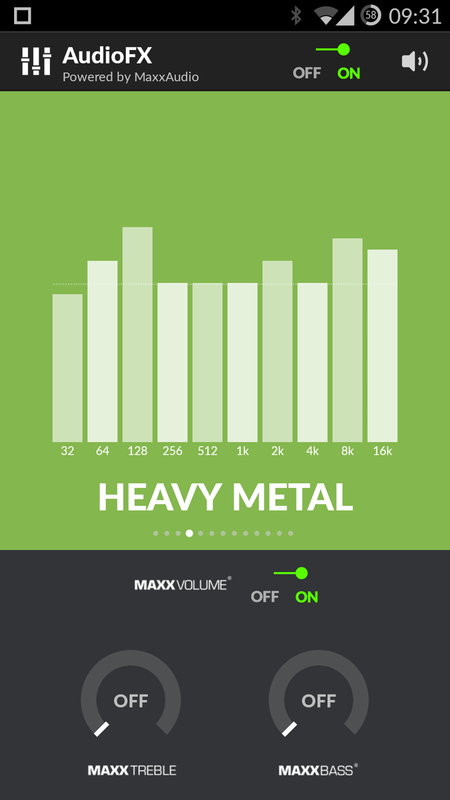 Only the mids are weak, and although bass is audible, they lack power. The so-called music effects can be adjusted according to personal preferences in the settings. The audio jack functions without noticeable shortcomings. The power consumption of the OnePlus One is inconspicuous and within the expected range. The LTPS screen is more energy efficient than the QHD screen in LG's G3 in idle mode. However, it is not as frugal as the Super AMOLED screen in the Galaxy S5. The power supply has sufficient capacity. Fast Charge is also supported and recharges the smartphone completely within two hours. The OnePlus One has a powerful, 3100 mAh battery. Thus, a long battery life is inevitable especially since the smartphone did not show any irregularities in power consumption. In fact, it dominates over the flagship division with its tremendous endurance. It was only when under high processing loads that the competition fared better. 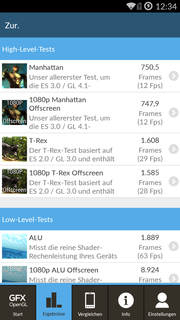 The review sample even outruns the Lumia 930 (16:42 h) and not only clearly dominates over LG's G3 (7:32 h), but also over both HTC's One M8 (7:33 h) and the Galaxy S5 (10:13 h) in the Wi-Fi browsing test using a screen brightness of 150 cd/m². This makes it tolerable that OnePlus does not give its One any special energy saving modes. OnePlus delivers a really good smartphone with the One that calls itself Flagship Killer - and not without reason. Although the processor loses some of its power during permanent load, the smartphone is fast, and other, considerably pricier competitors also struggle with these heat issues. The OnePlus One is also pleasant to hold, is equipped with great communication modules, and can even be used perfectly for telephony. Minor drawbacks are found in the details, such as the lack of a storage expansion that we primarily miss in the 16 GB model. 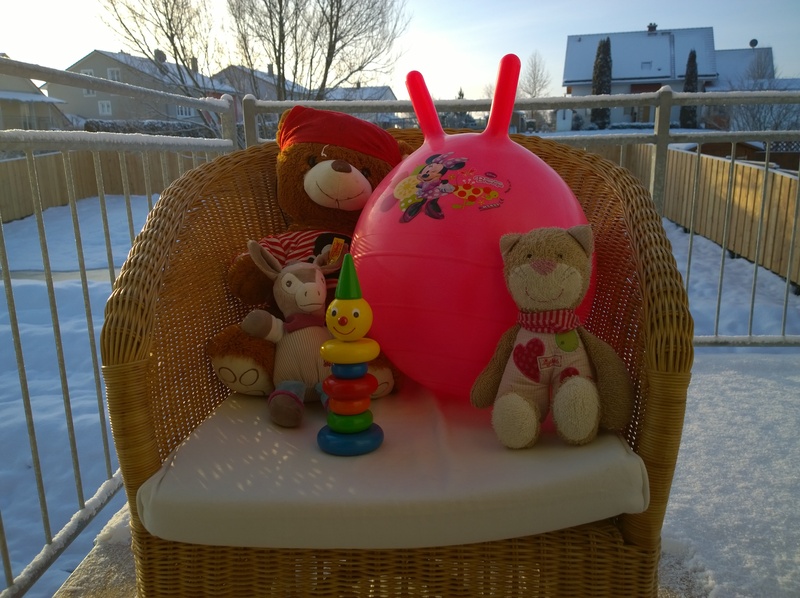 The camera takes decent pictures in daylight, but the low-light qualities are unsatisfactory. 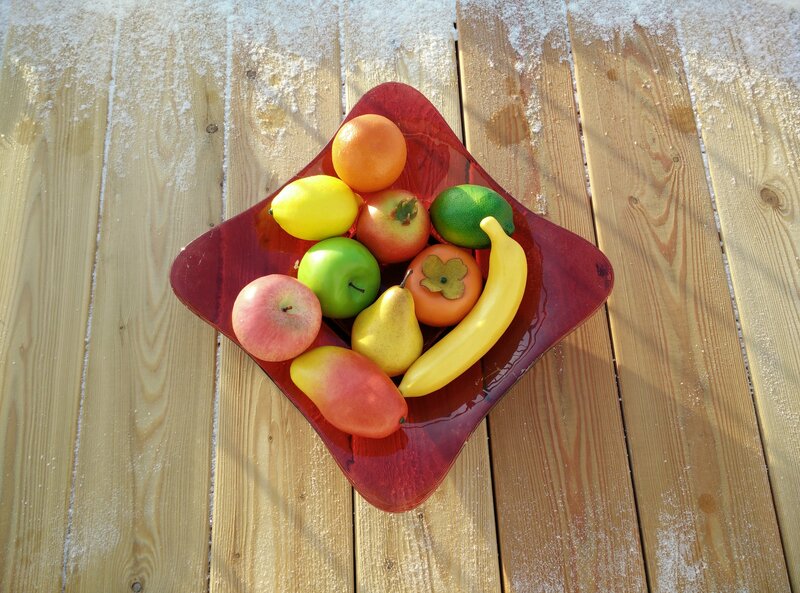 The high surface temperatures also prevent a better rating. We give a plus point for the outstanding performance-price ratio, which remains unmatched. 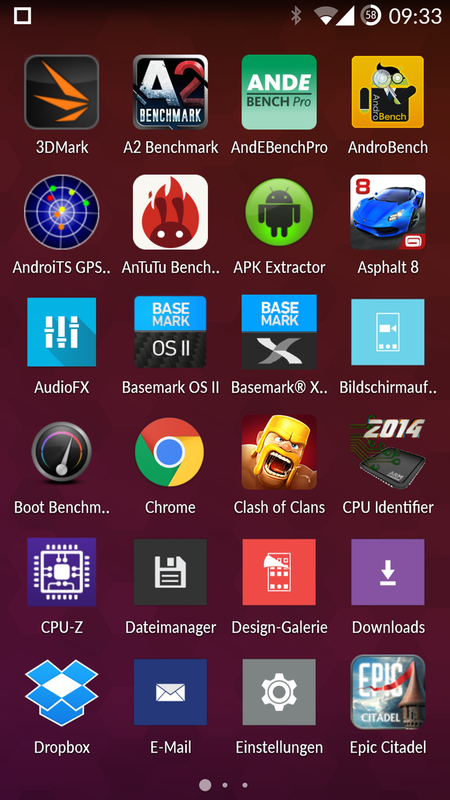 There is currently no smartphone with a better configuration for less than 300 Euros (~$322), when the user is a fan of CyanogenMod. The screen has a size of 5.5 inches. It has a resolution of 1920 x 1080 pixels. The front-facing camera has a resolution of 5 MP. The sensor keys can be swapped for on-screen buttons. OnePlus uses an LTPS screen. The SIM slot is opened with a small tool. The SIM slot closes flush with the rest of the casing. The rear features a roughened sandstone texture. A dual-LED flash supports the 13.1 MP camera. The USB cable does not tangle easily. 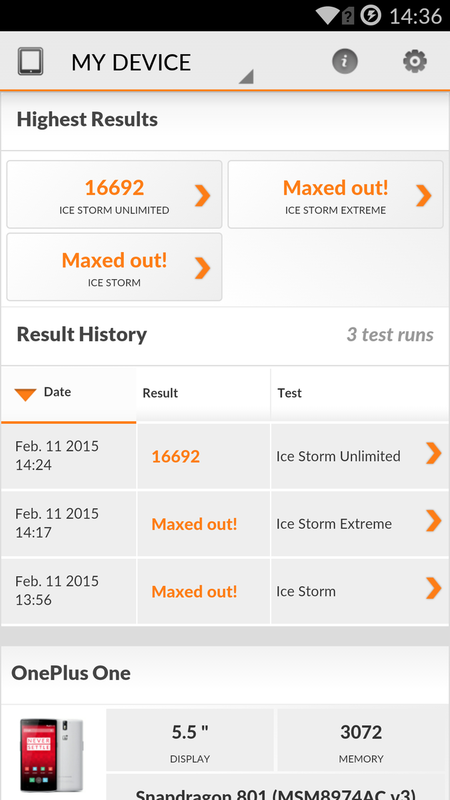 The target is missed in 3DMark. 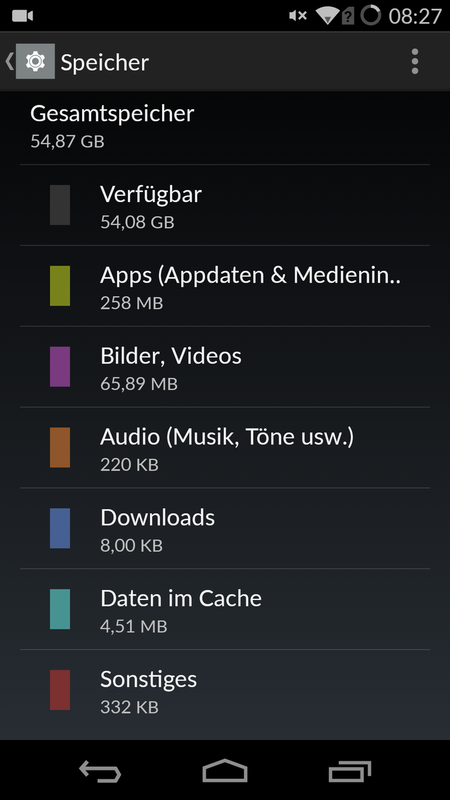 54.08 GB are available for use. OnePlus bundles a very well-conceived, premium-range smartphone for an until now unmatched performance-price ratio. 800 MHz band support for LTE. The Chinese manufacturer manages to sell a real top-of-the-line smartphone for half the price. The contenders are: Samsung Galaxy S5, HTC One M8, Sony Xperia Z3, Apple iPhone 6 Plus, LG G3, Nokia Lumia 930, Motorola Moto X, and Google Nexus 6.